Abortion Rights » Action on Abortion – tomorrow! Action on Abortion – tomorrow! 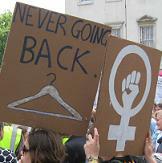 Rally for abortion rights: 2pm, Sat 29th Sept, Old Palace Yard, opposite Parliament. Today is International Day of Action for Safe and Legal Abortion – it’s being marked by reproductive rights groups across the world. We’ll be joined by Green Party Leader Natalie Bennett; Jennifer Reiter from the Abortion Support Network which helps women from Northern Ireland access safe abortion in the UK; by NUS National Women’s Officer Kelley Temple and by our friends from UK Feminista. Follow us on Twitter at @Abortion_Rights for updates and look for the #ActionOnAbortion hashtag. It’s time for change – so join us at Westminster and demand Action on Abortion.